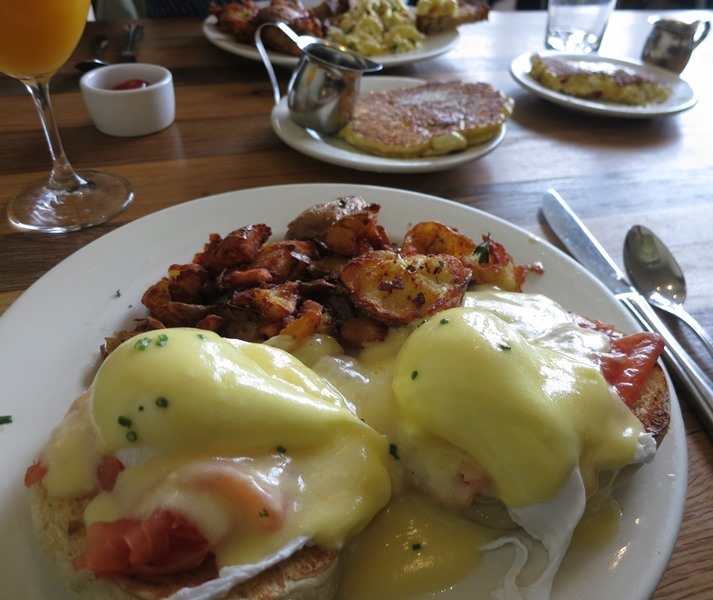 Sometimes I feel like there should be a sign as you enter San Francisco that reads: “SAN FRANCISCO: WE LIKE BRUNCH”. That would pretty much cover it. 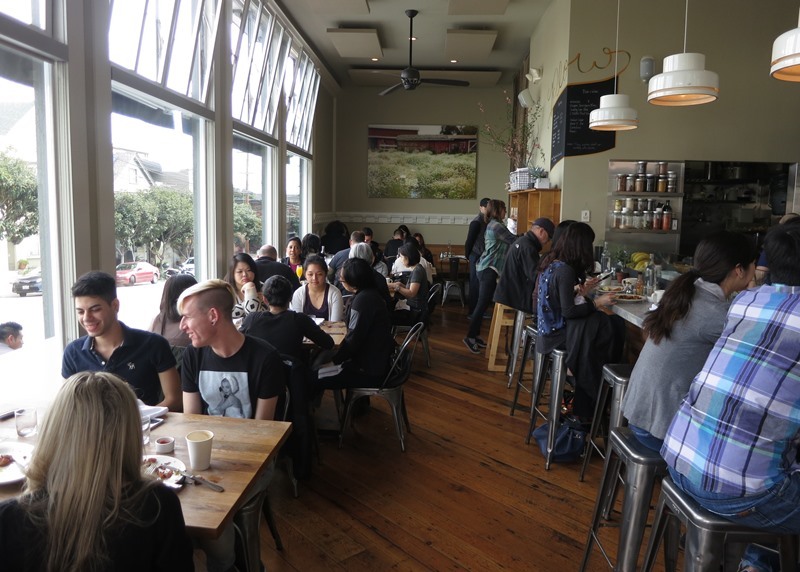 I’ve said it before and I’ll say it again: brunch is like a sport in SF. Good places are swarmed with people every weekend, especially Sunday. There’s probably a dozen places I could name off hand that will have over a hour wait if you saunter in for brunch around 11am on a Sunday sans reservation. Plow is one of these places. 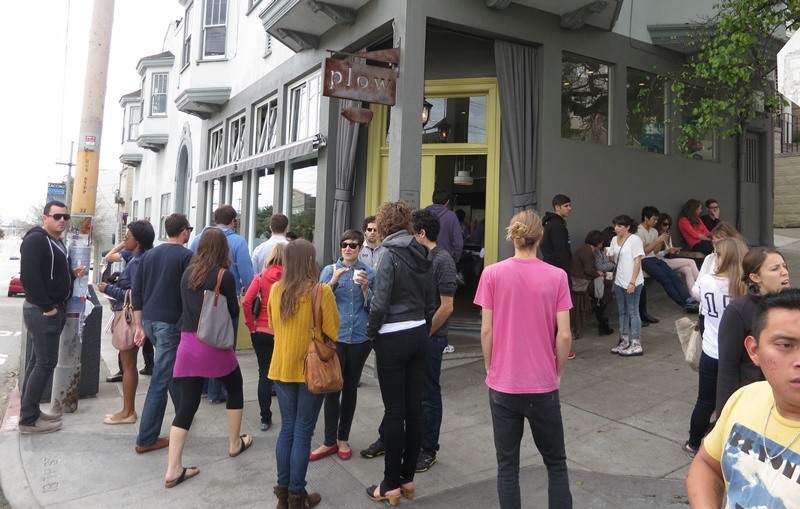 As Plow does not take reservations, we had to engage one of the many common SF brunch tactics. But this time, we had a trick up our sleeve: daylight savings time. On daylight savings day (the one in the Spring), you can get there at 10am, and it really is kinda like arriving at 9am. What does this do? Well, it doesn’t get you any more sleep than arriving at 9am, but, it does seem to get you the same wait time as if you arrived an hour earlier. Everyone else is sleeping! 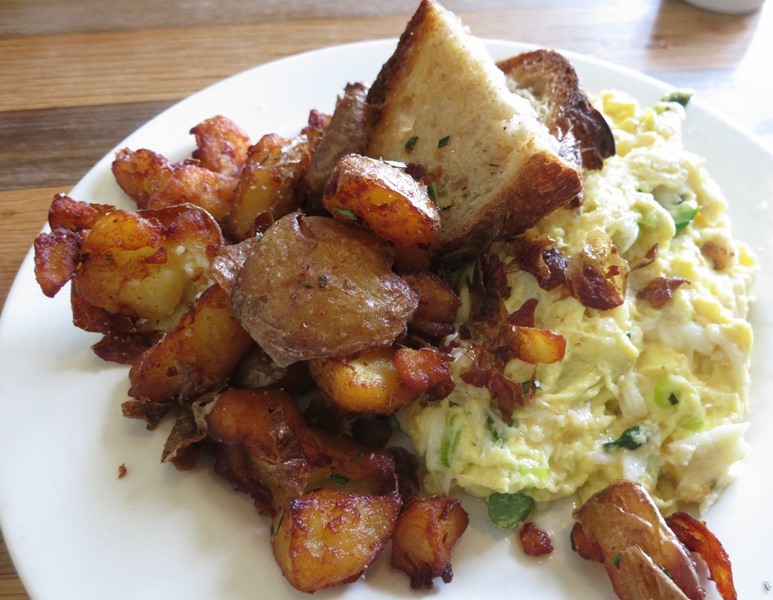 And you’re eating awesome brunch. Good work! Arriving so early meant we had about a ten minute wait, and then we were seated in their long, narrow, daylight-filled dining area. The menu is sort of old-fashioned meets modern — the only coffee is the kind that is held in a bulbous glass coffee pot and poured periodically into your thick-walled ceramic coffee cup, but the food menu puts a little twist on a variety of favorites, and offers a few yummy unique items. 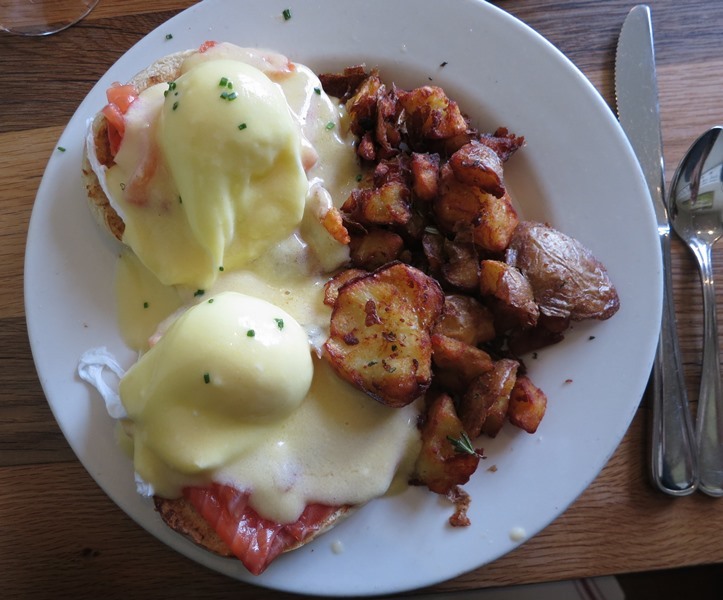 Despite my inclination to order absolutely everything on the menu (ex: raspberry glazed donut $4.25, chocolate banana bread $4.25, avocado toast $8.25, cold-smoked salmon toast $10, dungeness crab scramble $17), I went with my old favorite, eggs benedict with cold smoked salmon ($17). 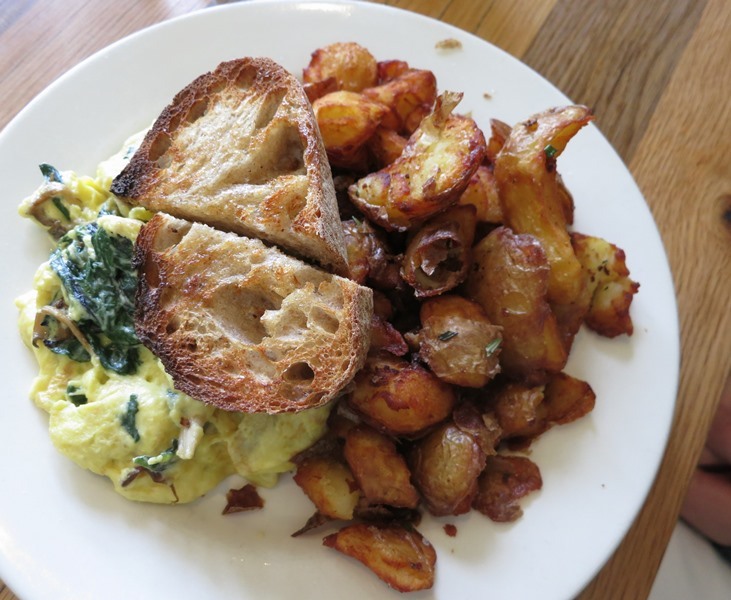 And, at the recommendation of a friend, my two lady friends and I shared two lemon ricotta pancakes ($5 each, or $13 for a meal of three), which were just as amazing as they were reported to be. 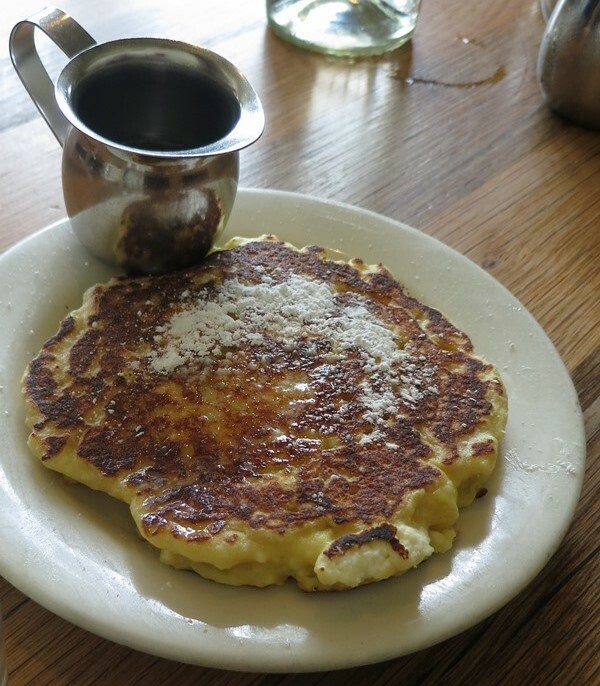 Oy, and that little lemon ricotta pancake? So. Good. And by the time we left, this was the line outside. Thank you daylight savings. Sounds and looks amazing! I want to live in the City!